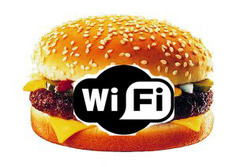 Americans are getting (sort of) excited because US McDonalds have just introduced wifi to their restaurants. This made me realise that UK McDonalds have had wifi for years. I hadn’t noticed till now, but I imagine using your laptop in McDonalds doesn’t work very well. Apart from the fact that the salt, sugar and burgers just send your brain into a weird quiet place, the finger grease would just make your touchpad unusuable.